What’s happening to our breathing in twists? Twists can often feel uncomfortable for those beginning a yoga practice. There is often a sensation that it’s hard to breathe. Why is it so common for breathing in twists to feel so hard? Let’s take an anatomical look at twists and breathing. We’ll take a look at what might be happening and how to evolve your twists for more comfortable breathing over time. What’s happening anatomically when we twist? Most of our twisting happens in the spine. We can get more specific than that though, as not all sections of the spine are created equal. The spine is made up of a series of individual vertebrae. Each individual vertebra meets the next vertebra, both above and below, at what is called a facet joint. In the thoracic spine, the shape of the facets and the orientation of the facet joints is so that they are essentially parallel to your back, which means that a lot of rotation, or twisting is possible here. Additionally, in the thoracic spine, the spinous processes are arranged with enough space between them so we can rotate without the spinous processes bumping into one another. This is not true of the lumbar spine, where the facet joints are oriented in a way that they quickly begin to bump into each other if we try to rotate much through this section of the spine. What muscles are involved in spinal twists? Any muscle that can contribute to rotation in the torso can contribute to, or if tight, restrict twisting through the spine. The internal and external obliques are involved in spinal twisting on the front part of the body. The deep multifidus muscles and the rotatores muscles (another group of deep spinal muscles) create movement from the back of the body because of their close proximity to the spine itself. Another important point to keep in mind is that, in the thoracic spine where we do most of our twisting, each of the vertebrae are attached to a pair of ribs. The ribs, of course, are a fairly rigid bony structure. This is important as they protect our vital organs. 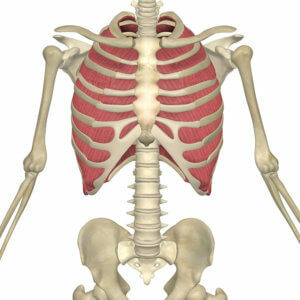 Between each rib we find the intercostal muscles. The fibers of the intercostal muscles run at an angle between each rib, so that when we twist these muscles are lengthened. If our intercostal muscles are tight, then they can restrict our ability to twist. What’s happening anatomically when we breathe? 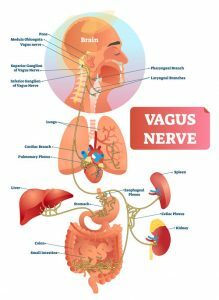 Breathing can be quite an involved operation in our body depending on the context, so we won’t get too far into the anatomical weeds here. With respect to twisting, the most important part of the breathing action that we need to understand, is what’s happening with the ribcage. When we breathe, the ribs lift up and apart from one another to make space for the air to come in. Those same intercostal muscles that are lengthened when we twist are also lengthened when we breathe. Why does breathing in twists often feel so hard? When we twist, remember that our intercostal muscles are being lengthened by virtue of their attachment to the ribs which are also being loaded with some tension as we twist. Muscularly speaking, length creates tension (not just contraction). 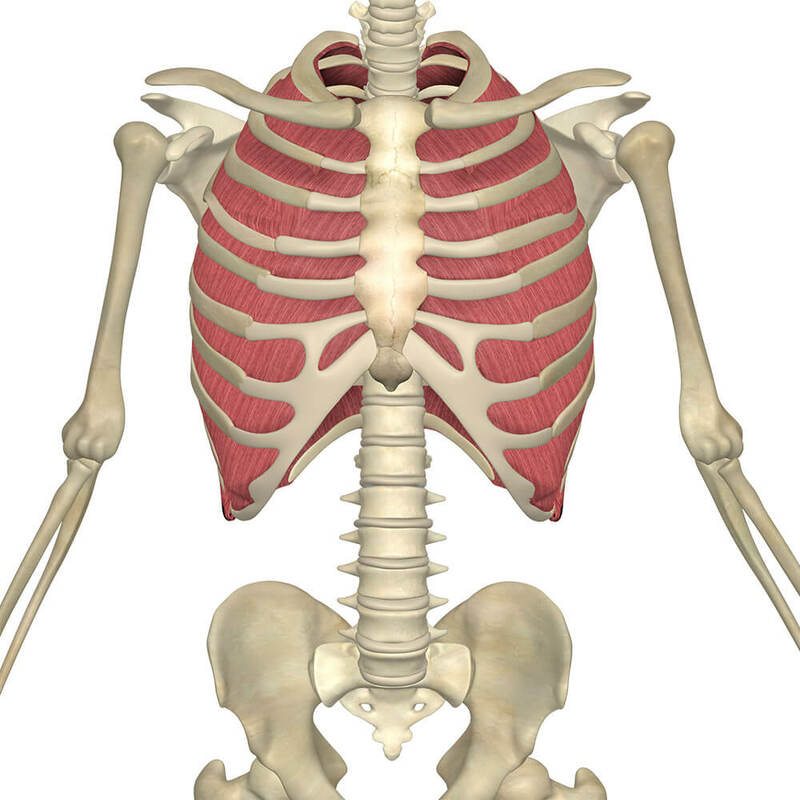 At the same time, we are trying to use those muscles to assist with breathing, which asks for even more length to bring the ribs apart, making space for more breath. When we are breathing in twists, our abdomen is compressed to some degree, which forces more air upward into the chest and adds even more pressure into those intercostal muscles. How can we learn to breathe easier in twists? There’s a bit of a paradox here. It’s the action itself of doing regular twists and practicing controlling the breathing while twisting that will eventually stretch the intercostal muscles and allow them to provide more space between the ribs when you breathe. So, yes, I’m saying you need to breathe in twists in order to breathe more comfortably in twists. If your intercostal muscles are tight, then twisting itself will help to lengthen them. Adding some gentle amount of pressure from the breathing in twists will, over time, stretch them even more. The more you can relax while breathing, the more effective your stretch through the intercostals will be and then the more space they’ll be able to create between the ribs over time. More space between the ribs means more room for air and ultimately a feeling of more ease while breathing in twists. Breathing in twists can feel like an impossible challenge for both beginners and more experienced practitioners. Be patient, and with regular practice your ability to maintain ease in the breath while twisting will evolve over time. 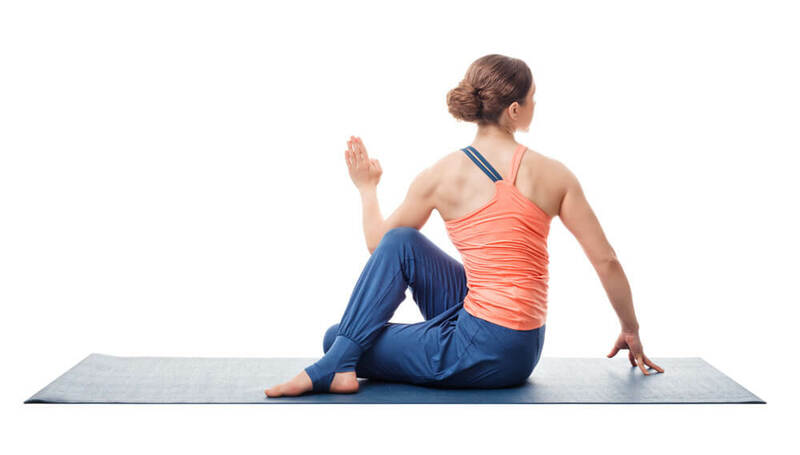 If you find breathing a struggle, back off the pose slightly, close your eyes, and focus on the breathing itself, rather than the depth of the twist. Each individual ‘vertebrae’ should read each individual ‘vertebra’ – I teach my students that a woman can only wear one bra at a time. That helps them remember the singular of vertebrae. 😊.